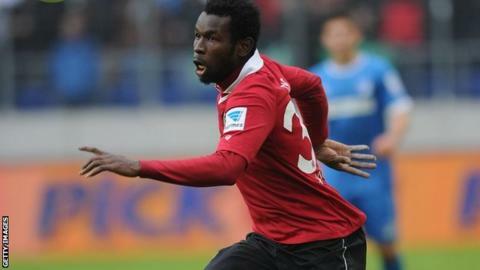 Stoke City are hoping to complete a deal for ex-Manchester United striker Mame Biram Diouf from Hannover 96. Potters chairman Peter Coates has confirmed they are close to signing the 26-year-old Senegal international, who has rejected the offer of a new deal. Diouf first arrived in English football in December 2009 when he signed for United from Norwegian club Molde. The Senegal player made nine appearances, netting his only United goal in a 3-0 Premier League win over Burnley at Old Trafford. He also began a season on loan with Blackburn Rovers in August 2010, scoring six times in 30 appearances, 12 of them as substitute, in his year under Sam Allardyce, who signed him, and Steve Kean at Ewood Park. Diouf, who was linked with a move to his former Molde and Man Utd reserves boss Ole Gunnar Solskjaer's Cardiff City in January, missed the final two months of the season with a shoulder injury. He has turned down the offer of an extended contract with Hannover, for whom he has hit 30 league goals in 68 games since joining the Bundesliga club in January 2012. If he signs, he would become Stoke's second summer signing, following another former Manchester United player, Sunderland defender Phil Bardsley, to the Potteries. Chairman Coates suggests that, unlike his Stoke predecessor Tony Pulis, Hughes, still settling in at the Britannia Stadium this time a year ago, is keen to do most of his shopping early in his first full summer transfer window. "We've got a few irons in the fire with other players," added Coates. "Mark knows who he'd like to get. "Tony Pulis had a preference for leaving things late. I wasn't always sure he was right but that's what he felt, so we tended to go down that path. Mark would rather do things earlier.